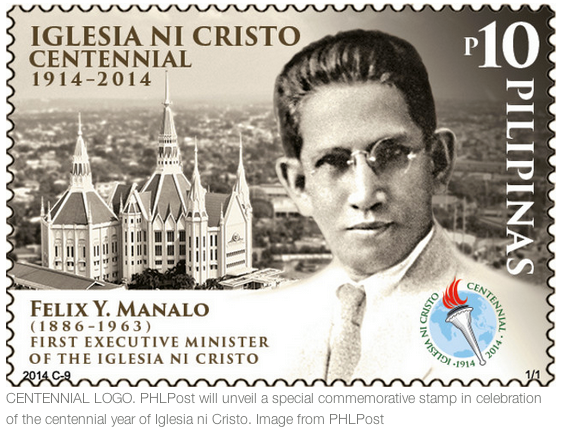 MANILA - A Palace spokesman on Wednesday defended the printing of 1.2 million commemorative stamps featuring Iglesia ni Cristo founder Felix Manalo amid criticism that it violates the separation of Church and State. Presidential Spokesman Edwin Lacierda said this is not the first time that the Philippine Postal Corporation (PHLPost) printed similar commemorative stamps that have a religious orientation. He said that in the 1950s, a similar case was filed before the Supreme Court questioning the printing of commemorative stamps for Manila's hosting of the Eucharistic Assembly. "That particular stamp was also questioned before the Supreme Court and the Supreme Court said that it was not in violation of Church and State," he said. "These are all commemorative stamps that we do. So we do not believe that this is in any way a violation of Church and State-between Church and State," he added. PHLPost, a government-owned and -controlled corporation, earlier said it will issue stamps to commemorate the Centennial Anniversary of the Iglesia ni Cristo. The postage stamp features INC founder, Bro. Felix Y. Manalo (1886-1963), the logo of the INC centennial anniversary, and its sprawling Central Temple at the background located in Quezon City. PhlPost said it will be the first time it will issue a bigger stamp measuring 50 mm x 35 mm in size. A regular stamp measures 40 mm x 30mm. The stamp was designed by Bro. Bienvenido Santiago, Jr. of Iglesia ni Cristo while the layout was provided by Vic Serevo. PHLPost has produced 1.2 million pieces of P10 denomination of the stamps. Editor's Note: The word "INC founder" is the word of the ABS CBN report, but it doesn't follow that we agree or verify it. The stand of the Iglesia Ni Cristo is firm, that the Lord Jesus Christ and not brother Felix Y. Manalo is the true founder of the iglesia Ni Cristo (Church Of Christ).